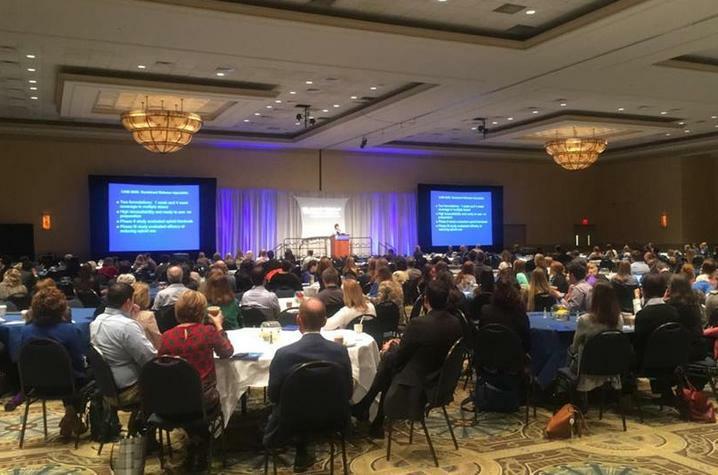 LEXINGTON, Ky. (April 17, 2018) – The 13th Annual Spring Conference of the University of Kentucky Center for Clinical and Translational Science (CCTS) was held April 13 at the Lexington Convention Center. While the CCTS supports research across the spectrum of diseases, this year’s conference focused on using translational science to address the opioid epidemic. Nearly 1,000 researchers, clinicians, students, trainees, community partners and local and national experts participated in the day-long, multidisciplinary event to share their findings and enhance collaborations. In addition to plenary presentations by nationally renowned speakers, around 300 posters were presented, along with 12 podium presentations by CCTS trainees and six by graduates of the Community Leadership Institute of Kentucky, which provides training and funding to Appalachian community leaders working to implement health promotion programs at the local level. Several representatives from the National Institutes of Health (NIH) attended the conference, including Dr. Michael Kurilla, director of the Division of Clinical Innovation at the National Center for Advancing Translational Science at the NIH (which has funded the UK CCTS since 2011 through two Clinical and Translational Science awards); Dr. Redonna Chandler, director of the AIDS Research Program at the National Institute on Drug Abuse at the NIH; Dr. Lawrence Tabak, principal deputy director at the NIH, who presented a talk on opportunities in biomedical research. The plenary address was delivered by Sharon Walsh, Ph.D., director of the UK Center on Drug and Alcohol Research and this year’s conference chair. Her address focused on the role of science in tackling the escalating opioid epidemic in order to better understand the disorder and develop better therapies. Dr. David Fiellin, director of the Yale Program in Addiction Medicine, gave the keynote address, exploring the role of NIH implementation science in addressing the public health crisis. Both speakers acknowledged that overdose deaths, which currently number approximately 140 per day, are only the tip of the iceberg in the opioid epidemic. For every one overdose death, many more people remain plagued by untreated opioid use disorder, which affects their entire families and communities; only 10 percent of people suffering from the disorder receive treatment due to barriers such as insurance and payment models, stigma, transportation, and the displaced power of the legal system to inhibit care. Walsh and Fiellin also emphasized the dire need for increased access to evidence-based therapies, such as medication maintenance and wrap-around support services, to provide ongoing support for opioid use disorder, which is a chronic, relapsing condition that requires ongoing care in the same way as diabetes or depression. Detox, they said, is not only lacking evidence for its efficacy but actively endangers individuals by leaving them highly susceptible to relapse and overdose, and has been shown to have higher rates of death than medication maintenance and support services. Sandra Comer, Ph.D., professor of clinical neuroscience at Columbia University, also delivered a talk on medication development for opioid use disorder, as part of the 34th Annual BGSFN Spring Neuroscience Day, one of several college and center-specific events held in conjunction with the CCTS Annual Conference. Other collaborating events were the UK College of Dentistry Research Day, College of Engineering Biomedical Research Day, College of Health Sciences Research Day, College of Nursing Scholarship Showcase, College of Public Health Research Day, and MD/PhD Program Research Day. David Feola, associate professor of pharmacy practice and science and director of graduate studies in the UK College of Pharmacy. Christina Studts, assistant professor of health, behavior and society in the UK College of Public Health, and also a former CCTS KL2 Scholar. Amr El-Husseini Mohamed, associate professor in the Division of Nephrology in the UK College of Medicine. The annual Special Recognition Award was given to Mike Bardo, PhD, professor and director of the UK Center for Drug Abuse Research Translation, in honor of his 35-year career dedicated to research and training in the clinical and translational science of drug abuse. The full list of speakers and poster abstracts is available here, and interviews with CCTS director Kern and conference chair/CDAR director Walsh are available via WUKY. The UK Center for Clinical and Translational Science is supported by a Clinical and Translational Science Award from the National Center for Advancing Translational Science at the National Institutes of Health.